The VHNK is collecting much information about our Kooikerhondjes. Since many years this information is recorder on paper, into the well-known Club register. The Club register is updated anually. To share updated information directly with breeders and friends of the Kooikerhondje breed, we are using since 2012 the database ‘ZooEasy online’. ZooEasy online is an online database, so with an internet connection available you can use it anywhere and at any time. Always access to the most recent information of the Kooikerhondje population worldwide. The VHNK is the owner of this database and is responsible for the content and sale of the accounts. The database producers provide excellent technical support and the data safety is guaranteed by backups. With ZooEasy online it is possible to find every dog and its pedigree. 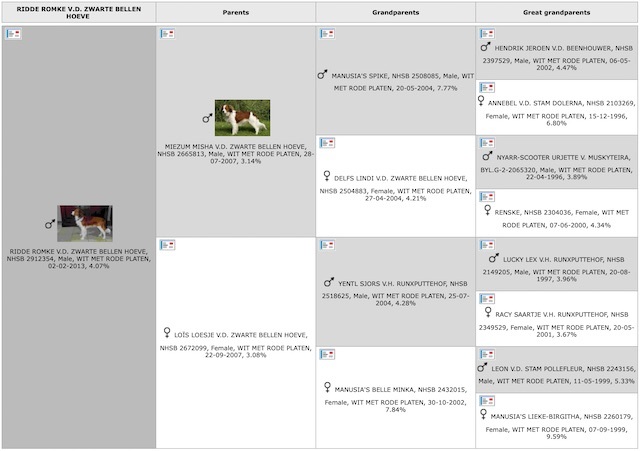 Within the pedigree you can find all the ancestors of a dog by clicking on the dogs in the pedigree. You can also find the available health results, exterior characteristics and photos. 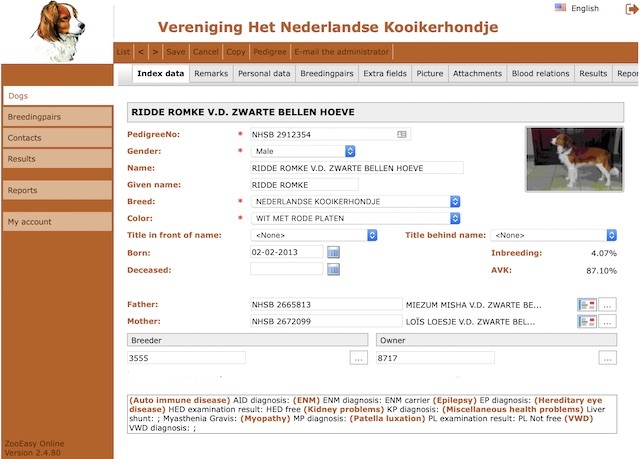 The database is updated every three months with new Dutch kennelclub registered Kooikerhondjes. For data of litters bred outside the Netherlands we rely on supply of our foreign sister associations. All health information presently known, as is already collected in the paper register, is manually entered in reverse order. At date (January 2019) this information is complete from today up to 2000. New health results are directly entered after every meeting of the Information Committee, which is at least 4 times a year. After receiving an official diagnosis of a recently reported healthproblem, this is also included immediately. This way we share all available information directly with our users. A large part of our Kooikerhondje population is bred outside the Netherlands. Therefore, we are working closely together with the breeding committees of our foreign sister associations. Data from abroad is collected in de paper register as well as in ZooEasy. Users can choose between “read-only” accounts and “breeder” accounts. Purchase an account by filling out one of the forms below and by transferring the required amount to the Treasurer Mrs C. Cop. After the payment is received, the database manager will make the account accessible. You will be notified of this. At that moment the account is ready to use. The filling of the database is mainly done by hand. We can understand that questions may arise or some things may not be clear. Please communicate this to the Information committee, so we can work together and make the database both complete and user-friendly. Ask the VHNK Zooeasy team by using the button (in ZooEasy) ‘E-mail the administrator’. The VHNK regularly organises a user meeting. Current data are found in the Eventlist. Below follows a short summery of the account specifications and costs.